Breathe new life into old pots by turning them into fairy house planters. Anything fairy-related seems to be a trend lately – from fairy lights, to fairy bottles, and fairy houses. There’s an app where people post their fairy crafts and they’re so adorable I want one of each. One time, I came across these fairy house planters and I immediately fell in love. I knew I had to have them in my garden. It’s a simple and inexpensive project but the finished product is whimsical and adorable! The good thing about this project is that it combines aesthetics and function. It’s simple and inexpensive and it’s a great way to decorate boring pots. As for me, it added life to my plant pots and it complemented my landscape really well. Make several of these and create a magical world for fairies that live in your garden! 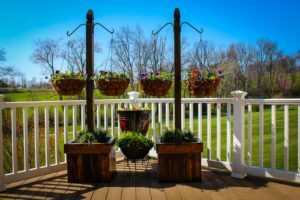 Build a beautiful hanging basket planter for displaying flowers!